Before I went for bootcamp (Miss World Malaysia 2009), I decided to have one big and hearty meal to prepare me for the next few days of semi-starvation. And after blowing quite a huge amount of money on my hair (that’s why I had nice hair on stage okay…), dinner had to be at some place reasonable, so the hole in my wallet wouldn’t grow bigger. 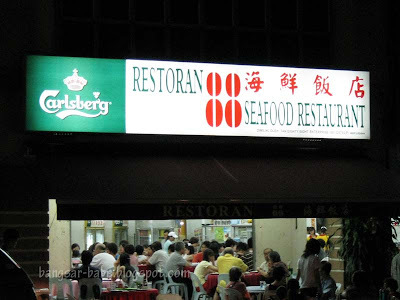 I like going to Restoran 88, as they serve pretty good food at pocket-friendly prices. The Marmite pork ribs (RM10) were juicy and tender. 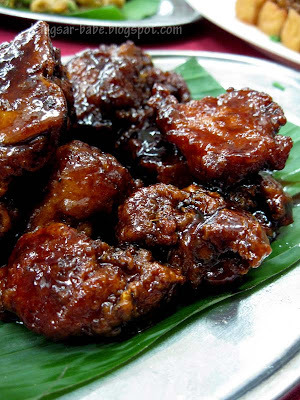 At first bite, you will taste the sticky and slightly sweet caramelised Marmite glaze, followed by the meatiness and slight hint of fat from the pork. Then, the pork juices will ooze out and the tenderness of the meat paired with the flavourful Marmite coating will leave you licking your lips and cutlery, or in my case, my first three fingers. We finished everything, including the cucumber slices, which we used to mop up the remaining Marmite sauce. 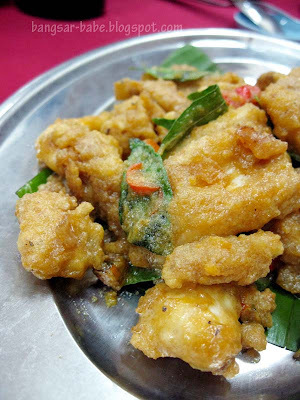 Salted Egg Yolk Squid (RM12) is something you should never order when you are watching your weight or if you have super high cholesterol. But since I was going for bootcamp, I couldn’t care less. The egg yolk coating was not as rich as the one from King Crab, but it was still pretty good. I liked the buttery and slightly grainy texture of the egg yolk coating. When paired with the tender yet chewy squid rings, they were an exemplary combination. It was a good balance of flavours and textures – savoury, creamy, crunchy and chewy. Try this with plenty of chopped birds eye chilli for extra “kick”. 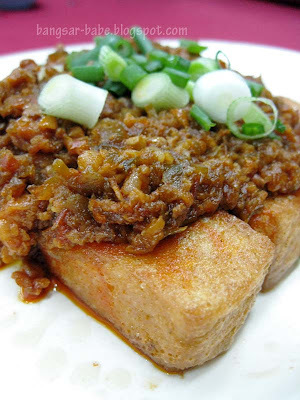 The signature tofu (RM8) was basically rectangular shaped tofu deep-fried till crispy at the edges and topped with spicy minced pork and preserved vegetables. The meat topping was not overly spicy, just enough to tease the palate and it complemented the egg tofu nicely. 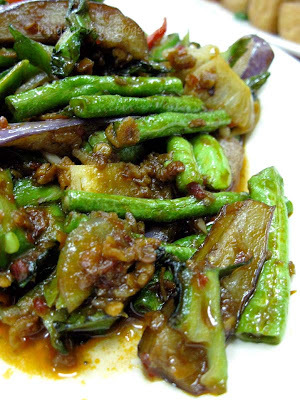 I think this dish is called four heavenly kings (RM6), which is basically a mix of long beans, 4-angled beans, petai (stinky beans) and brinjal cooked in sambal belacan sauce. This was decent, although not the best I’ve had. I reckon it could do with more belacan as it was not pungent enough. 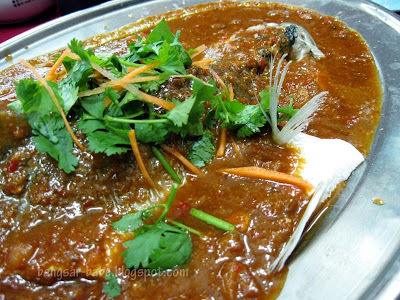 Since they were having a promotion for fish (RM18 per fish), we decided to try the steamed fish with spicy sauce. Served piping hot, the fish was fresh and firm, and did not reek of muddy, unpleasant taste often found in fresh water fishes. The spicy sauce was thick and flavourful, but the highlight of the dish was the sinful bits of crunchy pork lard sprinkled on top. Sounds unhealthy, but it was really good stuff. 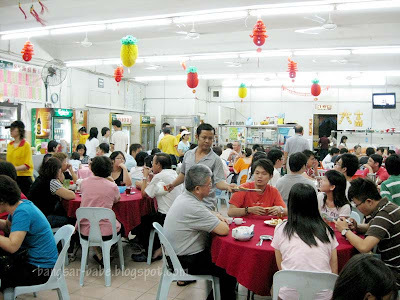 Dinner came up to about RM60 for 4 pax inclusive of rice and Chinese tea. Pretty reasonable considering the amount of food we ordered – I went home well fed and happy. Verdict: Try the Marmite pork and salted egg yolk squid. And don’t worry, you won’t leave the restaurant with a hole in your wallet. din know they hv such wicked squid here!